UPDATE: You can now view the IASPM Conference Schedule. The University of Sussex and the British and Irish Modern Music Institute (Brighton) are hosting the 2016 conference of the International Association for the Study of Popular Music, UK & Ireland branch. 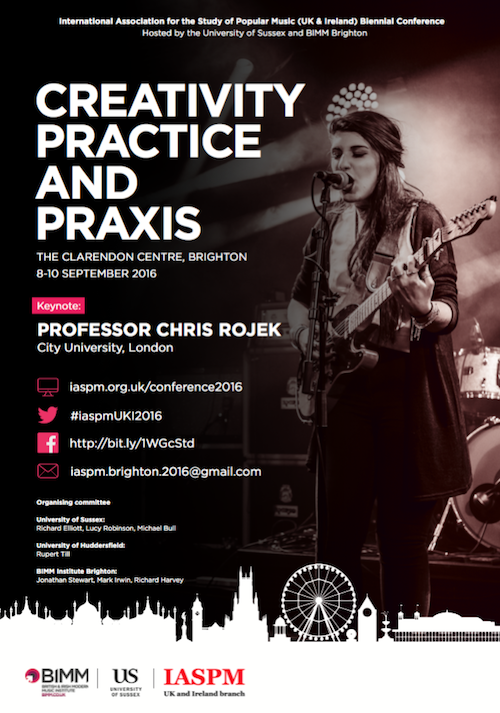 The theme of the conference is ‘Popular Music: Creativity, Practice and Praxis’. The conference fee includes registration for the conference itself, the book of abstracts, tea or coffee and refreshments throughout the meeting, guest wifi access throughout the meeting, and a wine reception on Thursday evening. A late booking fee of £20.00 is charged for registrations received from 1 July onward. Presenters who have not registered by 31 July will be removed from the programme. IASPM UK and Ireland branch are providing a limited number of postgraduate student bursaries for the IASPM conference. These will pay for the conference registration of £70. Postgraduate students should apply to the organising committee by emailing them at [email protected]. Priority will be given to those who do not have funding for their fees and/or do not receive a grant from a funder such as the AHRC. Please give a short statement of why you are a good candidate for the funding, and briefly outline your financial status. The deadline for receipt of applications is 5pm BST on 31 May 2016. Applicants will be informed of the outcome by 13 June. By taxi – Taxis from the airport can be expensive. If you wish to book in advance you can contact Sussex Chauffeurs either by telephone +44 (0) 1444 884170 or by email [email protected], website: http://www.sussexchauffeurs.co.uk. It will cost approximately £40 one way from Gatwick to Brighton depending on the time of day. You will need to pay in advance by credit card. By train – After clearing passport control and baggage reclaim make your way to Heathrow Underground station. This will be clearly marked. You will need to purchase a single Underground ticket from Heathrow to London Victoria station. This should cost approximately £5.00. The first leg of this journey is on the Piccadilly line – please see London Tube Map. On arrival at Green Park Underground Station you will need to change trains and board a Victoria line underground train heading Southbound. After one stop you will reach your destination – Victoria Station. On arrival at Victoria station follow the signs for Victoria Mainline Station/National Rail. Once at Victoria station you will need to purchase a return train ticket from Victoria to Brighton. The cost of this is approximately £30 Return but this fare varies depending on the time of day and can be cheaper if you book in advance. The ticket vendor will provide you with train times and relevant information or you can get further information and timetables from London Victoria to Brighton from the National Rail website. Please note that trains do NOT run all night – it is advisable to travel by coach if arriving at Heathrow after 9pm. By taxi – Taxis from the airport can be expensive. If you wish to book in advance you can contact Sussex Chauffeurs either by telephone (+44) (0) 1444 884170 or by email [email protected]. It will cost approximately £80 one way from Heathrow to Brighton depending on the time of day. You will need to pay in advance by credit card. Brighton is easily reachable by the UK train network, often with changes in London. Trains to Brighton can be caught from both Victoria and St Pancras; although the latter route is a bit slower it is well worth considering if you are travelling from the north to Kings Cross as you can just cross the road from KC to St P and don’t need to bother with the Underground. There is also a direct route to Brighton from Bristol Temple Meads – quite slow (lots of stops) but very scenic in parts. There are trains to Brighton from Ashford International for anyone travelling by train from mainland Europe. Brighton is also on the National Express coach network. For information, see above under ‘Air’ and the link below. Brighton offers a wide range of hotels to suit all budgets. A selection of hotels can be found at Visit Brighton, the official Brighton tourist site. In addition, the University of Sussex maintains an approved list of hotels and guest houses in the Brighton & Hove area. All of these establishments have been visited and approved by the University Approved Hotels Working Panel and will be reviewed annually. The list is available here.